One Savvy Mom ™ | NYC Area Mom Blog: Should You Rent Or Purchaase Your Next Home? 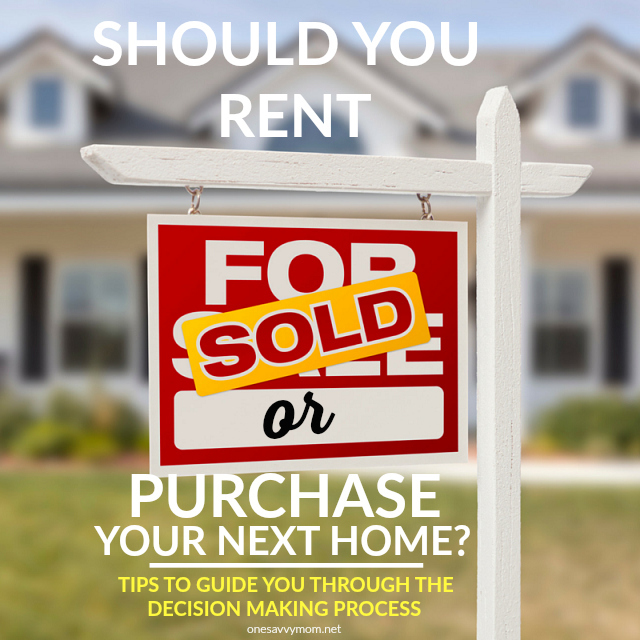 Should You Rent Or Purchaase Your Next Home? It used to be that purchasing a home was the pinnacle of life’s achievements, but these days, cultural changes and personal needs have made renting more enticing to many. There are a few questions you need to ask yourself before signing your name on a lease or making a down payment on a home, and these should get you on your way to a more comprehensive understanding of the best decision for you and your family. Can You Supply Upfront Costs? Do you have a large sum of cash that you can realistically part with right now? If not, then renting is probably going to be your best bet. For most home purchases, you’ll need to come up with at least 20 percent of a down payment, and many individuals are finding it hard to secure loans from traditional lenders. This is highly dependent on where you live; if you’re in a popular, competitive housing market like we are here, the likelihood of you being able to comfortably afford a home is narrowed. Can You Handle Multiple Payments? One of the most appealing aspects of renting is the simplified payment process. Beyond a rent check, you may have to pay utilities. One or two payments per month is easy to track and easy to budget. Homes are less than straightforward. Beyond mortgage payments, you’ll need to handle utilities, maintenance and repairs, property taxes, and more. If you’re looking for something straightforward and simple, a rental is the right fit. If you’re willing and able to handle multiple payments, purchasing is a viable option. Do you Need a Measure of Flexibility? Do you have a lifestyle that requires flexibility? Are you planning on expanding your family any time soon? Will you ever want to experience living in a new city? If you answered yes to any of these questions, renting might be in your best interest. Rentals afford their inhabitants a great deal of flexibility. If you lock yourself into a home purchase, you’ll have more to worry about when life events make it necessary to find a new space. In contrast, when renting, you’ll only need to give 30 to 60 days’ notice to your landlord (depending on your lease provisions) before you can pack up and head out. Are You Looking for Less Responsibility? Many choose to rent instead of own because of the responsibility associated with purchasing a home. In a rental, the landlord is responsible for maintenance and repairs, and handles the legal issues on top of that. Your main concern is abiding by the lease and making sure you pay rent on time each month. Home responsibilities can add up; issues like plumbing, roof leaks, and termite damage, for starters, would all generally fall under the responsibility of the landlord in most leases. If you’re looking to simplify your life and take a load off of your shoulders, renting is the way to go. Are you a no-frills person, or can you handle forgoing amenities in order to own your own place? One beneficial side of rentals is the access to amenities they provide. As there are many rentals available, landlords and property management companies have to compete to secure the best tenants. In order to do so, they’ve added enticing amenities like outdoor living spaces, upgraded appliances, and security options that you won’t find with a run of the mill house purchase—unless you’re willing to pay a lot more for improvements before or after you move in. Do You Understand the Downsides to Renting? When it comes to rentals, there’s always a heightened possibility of falling prey to a variety of scams. If you are putting your name and personal information out into the big wide world through application processes and what have you, always ensure your contact is utilizing certified tenant screening report services. This will keep your social security number and other personal info safe while you attempt to find the best fit for you and your loved ones. When it comes to checking out homes for rent, make sure to use well-known listing sites like Trulia, and never transfer or wire money until you’ve met the landlord and checked out the apartment. It can also be frustrating when lease provisions make it impossible for you to create the home of your dreams, whether that be through restrictions against painting the walls or even bans on pets. When making the decision between purchasing and renting a home, keep these aspects in mind before taking the leap.